SL Green Tenant Action Day Highlights! The Urban Air Foundation is an Action Tank formed to promote high-density in urban spaces. UAF is focused on using the real estate community’s knowledge base in order to impact positive change. We are a non-partisan, 501(c)(3) nonprofit organization comprised of members of the real estate and business communities that seek to promote sustainability. We recognize that sustainable cities and urban areas are an integral part of overall sustainability. What is an Action Tank? The Urban Air Foundation is an Action Tank formed to promote high-density in urban spaces. UAF is focused on using the real estate community’s knowledge base in order to impact positive change. We support action items that help achieve the goals of reducing urban air pollution and supporting the notion that sustainable design must be accompanied by sustainable planning. 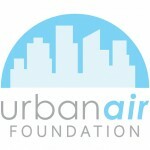 The Urban Air Foundation holds fundraising, education, and volunteer events that align with our core mission: reducing pollution in our busy and dense cities in an economically viable manner. Our steering committee is a made up of real estate owners/managers, and business leaders who look for opportunities to maximize our impact. We are currently funding projects that include local watershed cleanup, and reducing the urban heat island effect. For more information or to learn how you can make a difference in your city’s air quality, please visit Urbanair.org or email info@urbanair.org.